Located opposite from the historic Belmont Abbey College, this North Carolina hotel offers in-room flat-screen TVs and a free daily hot breakfast. The US National Whitewater Complex is within 8 miles of the property. 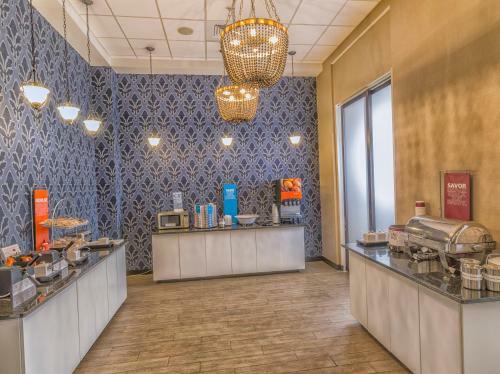 Free Wi-Fi and coffee-making facilities are provided in all rooms at this Charlotte-Belmont Hampton Inn at Montcross. An alarm clock is also provided. Guests can burn a few calories at the on-site fitness centre or take a swim in the seasonal outdoor pool. An on-site store is available as well. The Daniel Stowe Botanical Gardens and Schiele Musueum of Natural History and Lynn Planetarium are within 8 miles of the property. Christmas Town USA city centre is 2 miles away. Downtown Charlotte is also within driving distance. the hotel Hampton Inn Belmont at Montcross so we can give you detailed rates for the rooms in the desired period.